Rififi à Daisy Town Fédération Française des Diabétiques (France), Zippyware et Anuman Interactive (France), 2015 Play it Now ! aims to raise awareness about type 2 diabetes, its various risk factors and existing prevention methods. 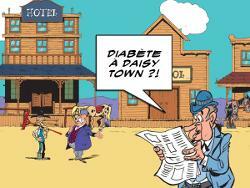 In France, 4 million people have type 2 diabetes and 400 new cases appear every day. This diagnosis is often too late because diabetes is a slowly evolving silent disease. The risk is the appearance of complications that could be avoided by earlier treatment. Food, physical activity, Lucky Luke goes back the track of diabetes avoiding the traps set by the Dalton in this game for the whole family!